A blue and sulphur sky for all of those of you who are heading into the greyer times of the year. 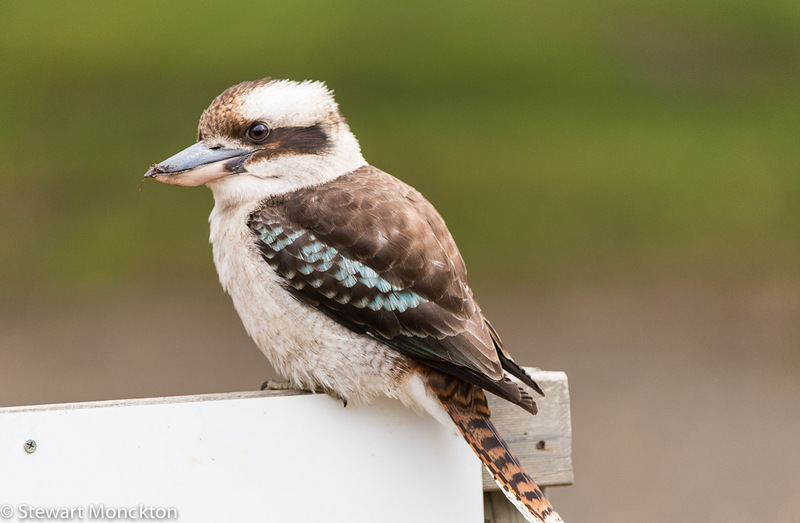 After last week's Magpies, this is another iconic Australian bird - the Laughing Kookaburra - or as it is called in my part of the world, just Kookaburra! 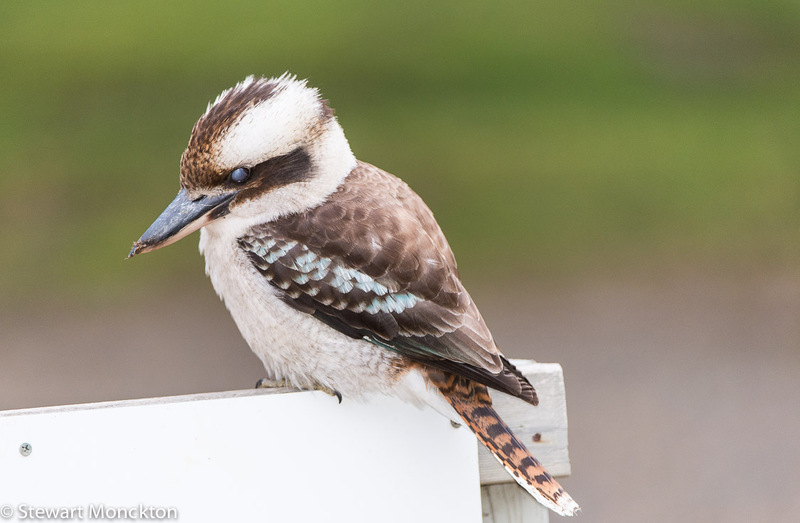 There is another species of Kookaburra further north from us, but I'd have to travel a very long way to see them! I'm a few days into a hectic week, so I just tell you that this is the largest kingfisher in the world! Also, I can't resist a good tale of taxonomy, busy or not. 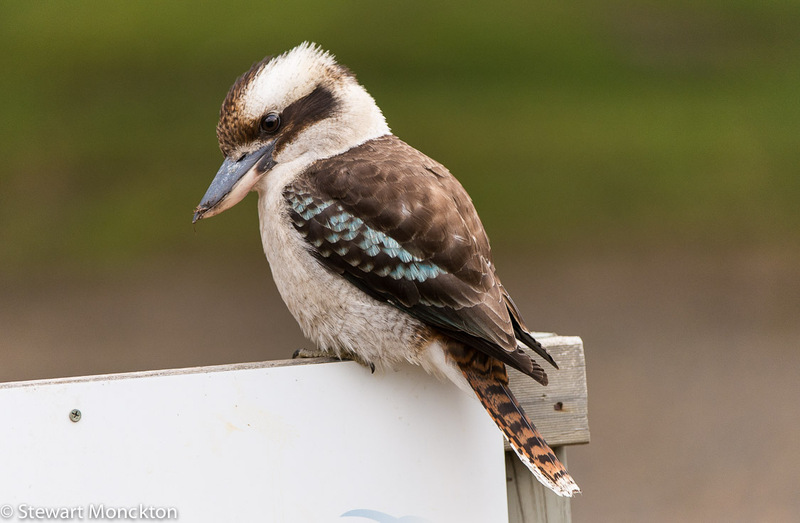 The Laughing Kookaburra goes by the name of Dacelo novaeguineae. The genus name is an anagram of the genus of the Kingfisher found in the UK - and the first specimen of this species was thought to have come from New Guinea. In fact it came from what is now New South Wales in Australia. So, the name is a combination of a private joke and a mistake! In one of these pictures you can see the nictitating membrane, a thin membrane that is drawn over the eye to help keep it moist. 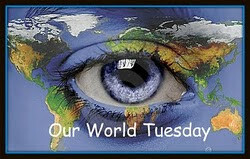 Now (as ever) its your turn to link up with WBW. Click on the blue button below and off you go. 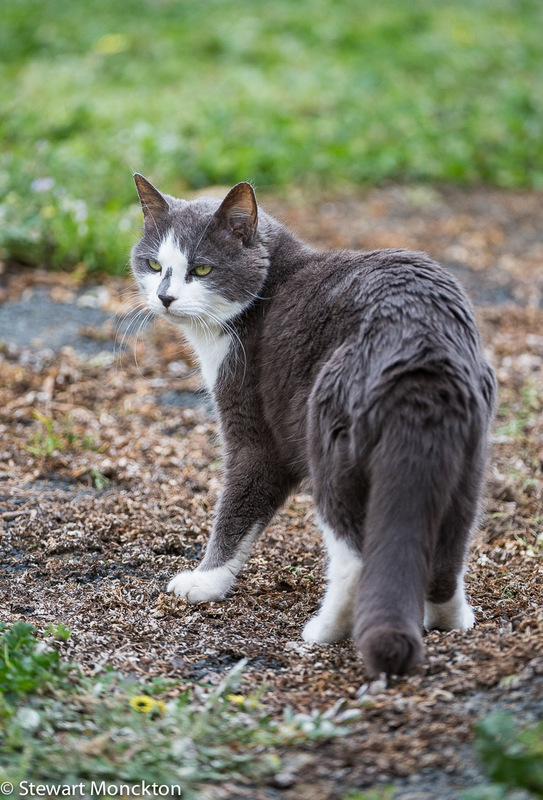 While we were away in the Grampians we had the pleasure of being in the company of this rather elderly mouser called Alice. Here legendary mousing abilities reminded me of a song from one of my favourite albums; as this is a photo-blog I wont inflict the song on you! But its reasonable to say, that neither the track nor the album is current! 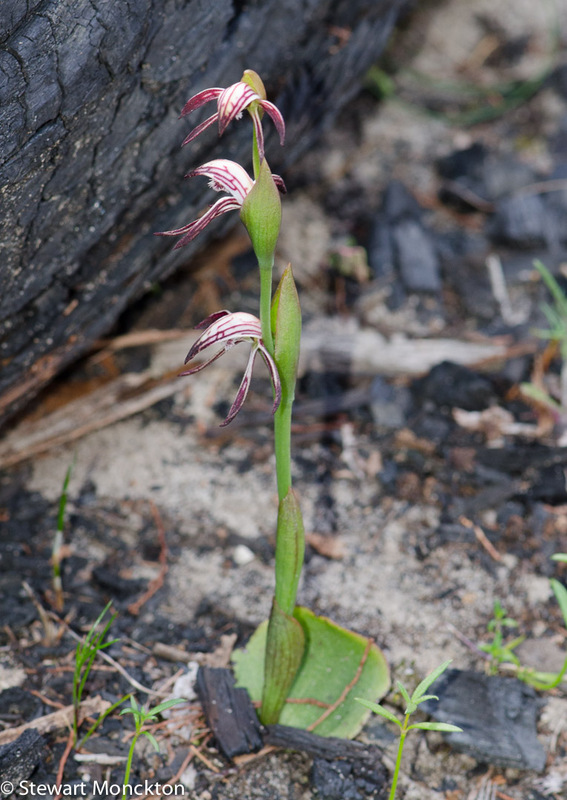 This orchid is called a Red Beak - and it has a very close association with that most Australian of elements, fire. You can see the the ground around the first plant is burnt - by the time I had taken a few pictures I was less than clean! More wildlife from my back garden! 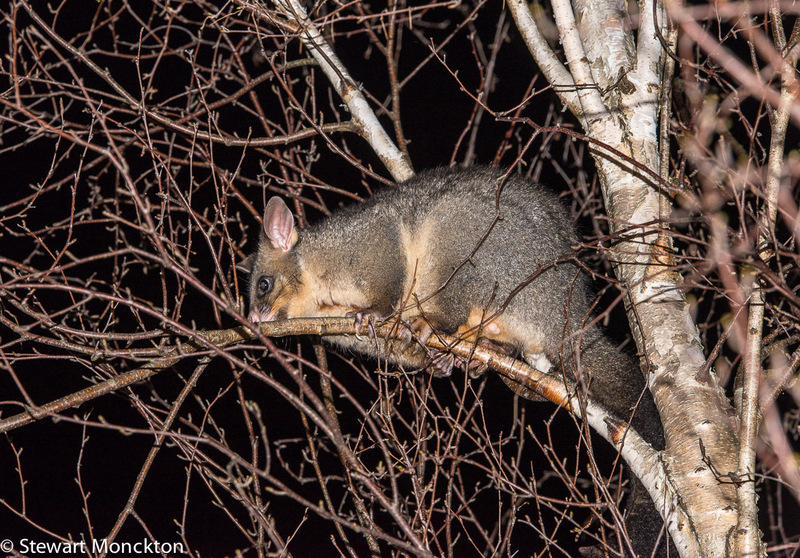 This is a Brushtail Possum, a common night time visitor to our garden. This picture was taken few week ago and our trees now have more leaves - but that can all change very quickly with these cat sized beasts about. If ever there was an animal I would like to keep out of my vegetable path it would be this one! You can find more animals from around the world at Saturday's Critters. I have posted images of this rather splendid bird before - but not images like this. 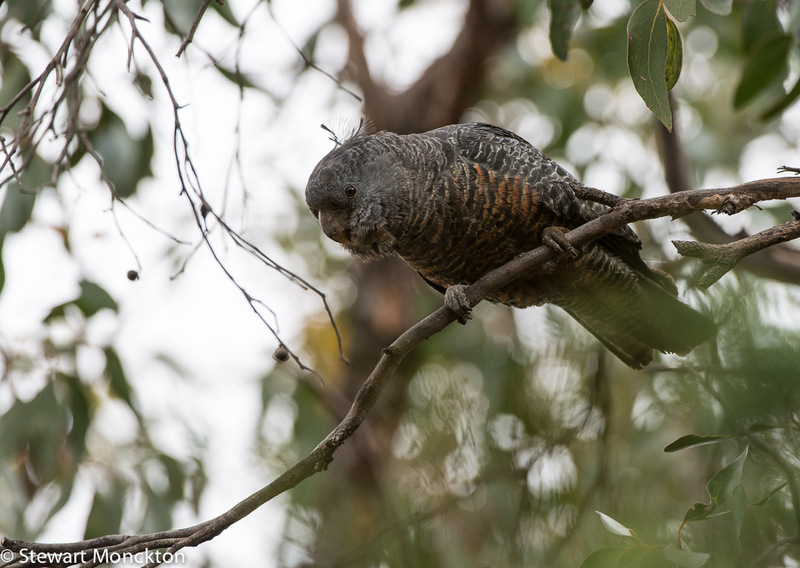 This bird is one of a pair that has raised three young in the oak tree in the garden behind our house. The young are now fledged and spend most of the day noisily demanding food from the hard pressed parents. My daughter, P, has taken a bit of a liking to this family and feeds them any meaty scraps we may have. It took the birds about a day to work out they were on to a good thing! These pictures were taken by putting a camera on a bean bag, pre-focusing the lens and then using a remote release. 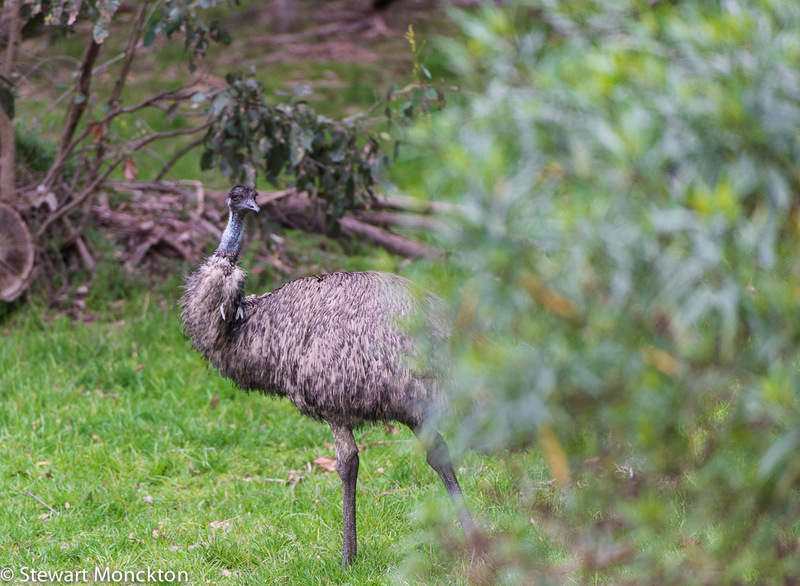 Having said that, I still only a couple of meters from the birds at the time each photograph was taken. Live view on the LCD and a 'quiet' shutter release setting also help things along. These bird make a wonderful fluting call - my next project will be to video this. For the taxonomically minded, this bird is known as Cracticus tibbicen (although this is a recent change of genus from Gymnorhina) which refers pipers or flute players. There are times when I think the Magpie may have been the model for a number of 'angry birds'! Now its your turn to join in by clicking the blue button below - you are only a few clicks away from linking up! 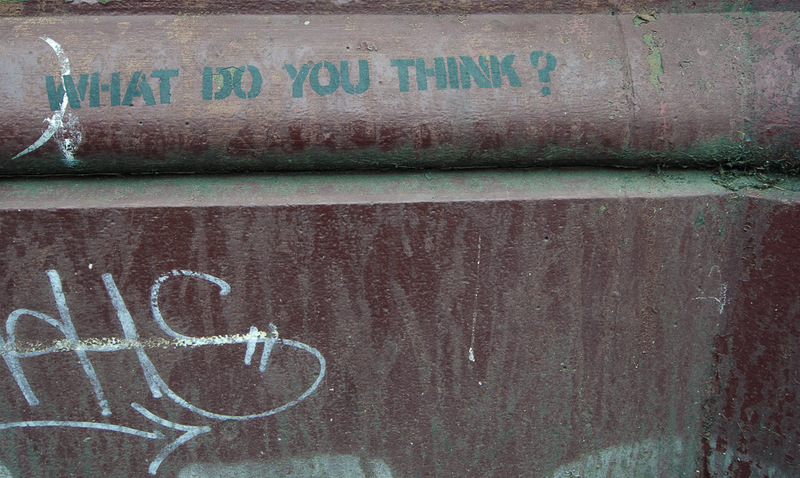 Word Verification has been doing strange things in the past 24 hours - please comment if it is still on, I'm doing my best to get it turned off - and I may have succeeded, but it's hard to tell! 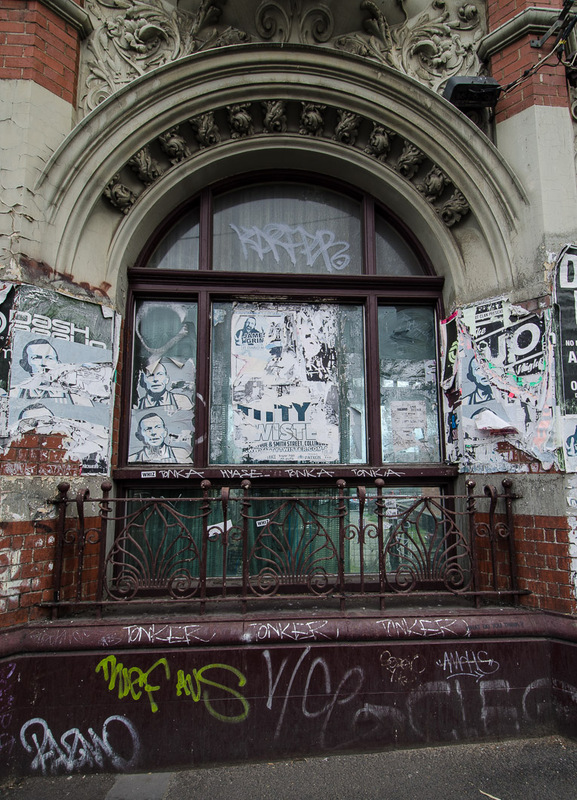 There must be a story here - this building has looked like this for at least 15 years. 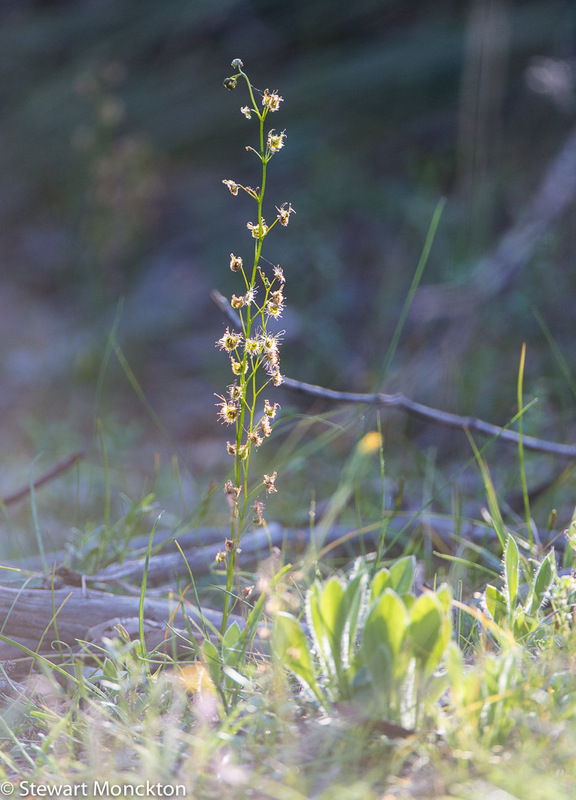 When we were in the Grampians in was peak sundew season. I've always had an interest in these carnivorous plants - plants that eat animals, what's not to like! I notice the way the sun was catching this plant and got low down to shoot it. 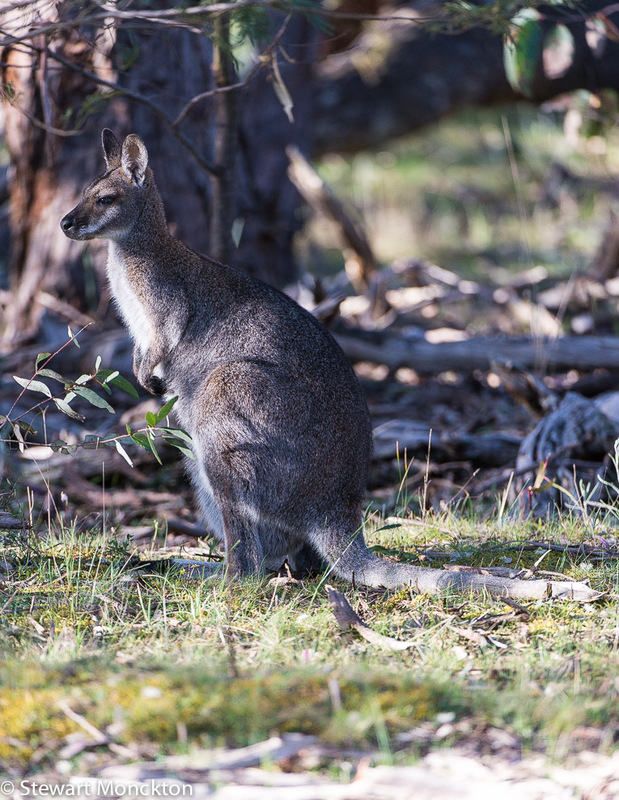 To continue from last weeks Eastern Grey Kangaroos, this time we have some Red-necked Wallabies. 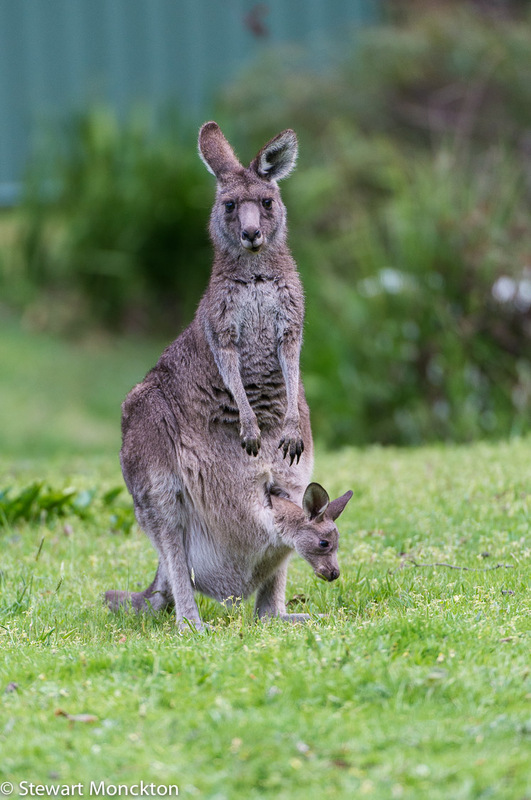 There is actually not that much difference between a wallaby and a kangaroo and scientifically they a very closely related. 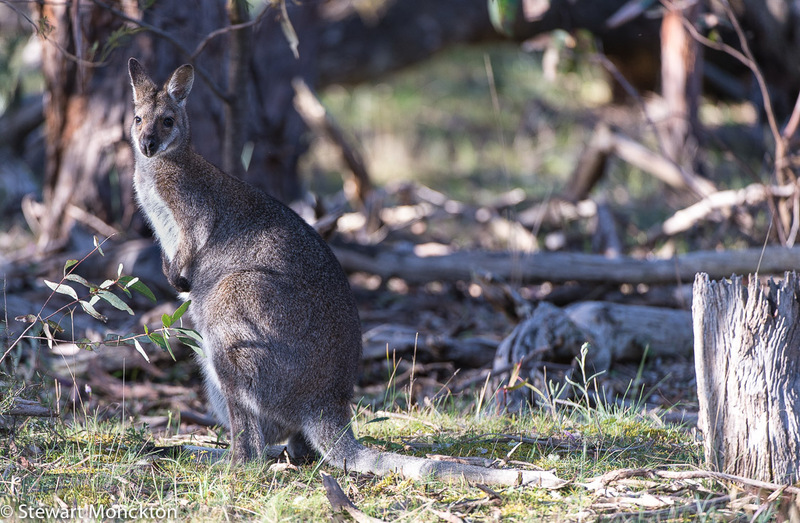 Compared to the Eastern Grey Kangaroo the Red-necked Wallaby is a somewhat smaller animal, as wallabies tend to be, which feeds on the leaves of shrubs and bushes rather than grass like a kangaroo. As you can see, one of these animals had found the the bushes were greener on the other side of the fence! 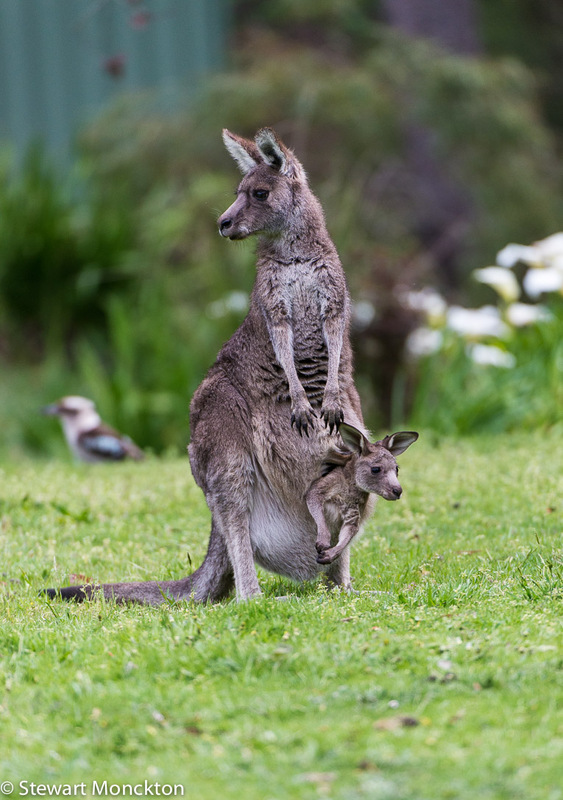 Also, if you look at the last image you can see a joey looking out of the pouch. 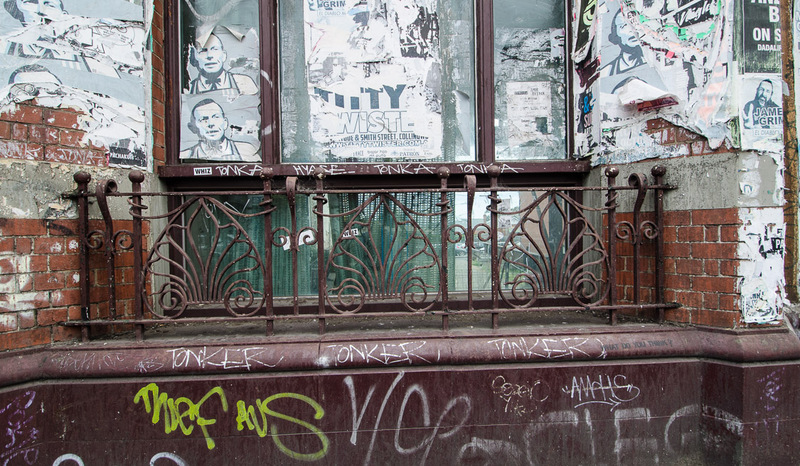 PS: I'm going to sneak this post in to "Good Fences" - well, there is a fence! 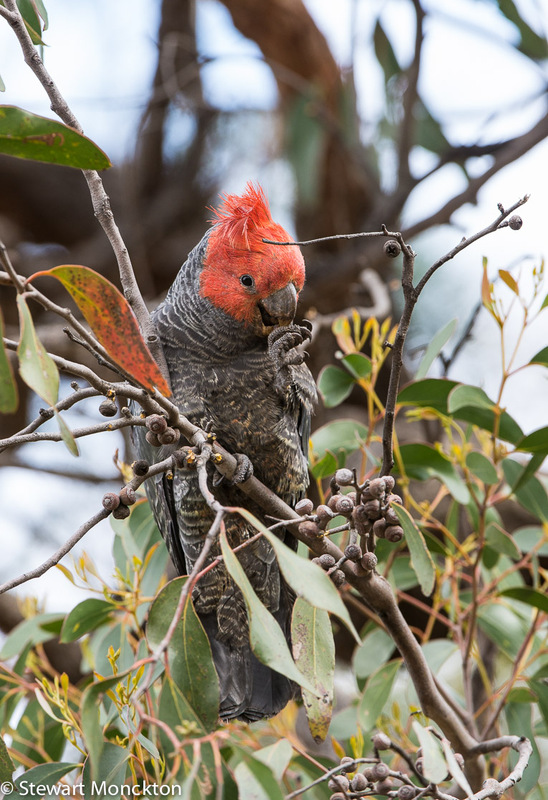 Firmly back in my part of the world this week with a cockatoo that only occurs in the south-east corner of Australia - it does not even make it to Tasmania (although it was found on some of the islands between the mainland and Tasmania in the past). 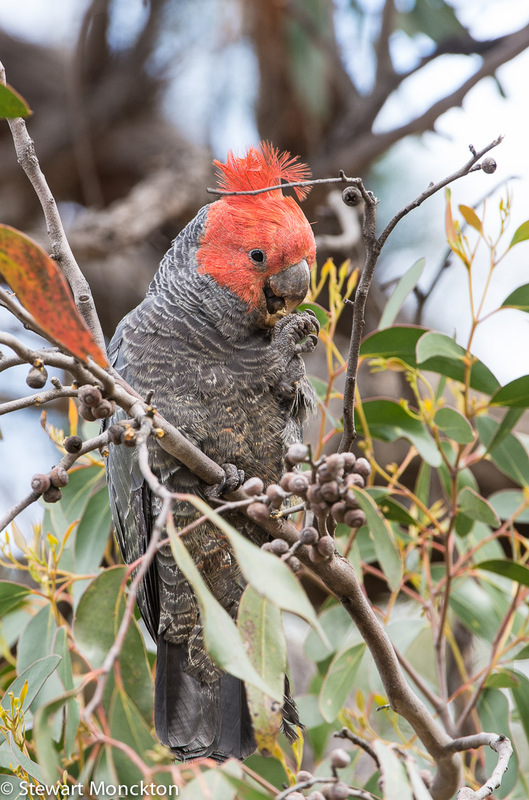 In contrast to many cockatoos this bird is rather self effacing and quiet. 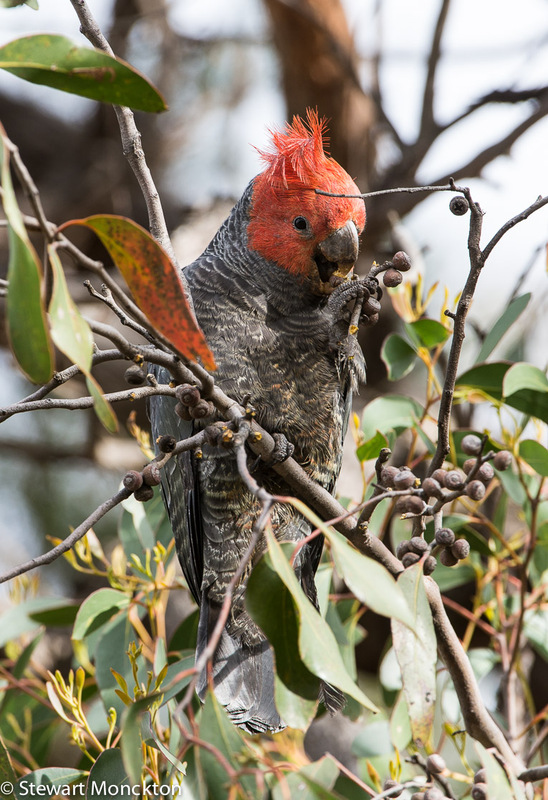 On many occasions, and this was one of them, they only give away their presence by the noisy cracking of gum nuts! 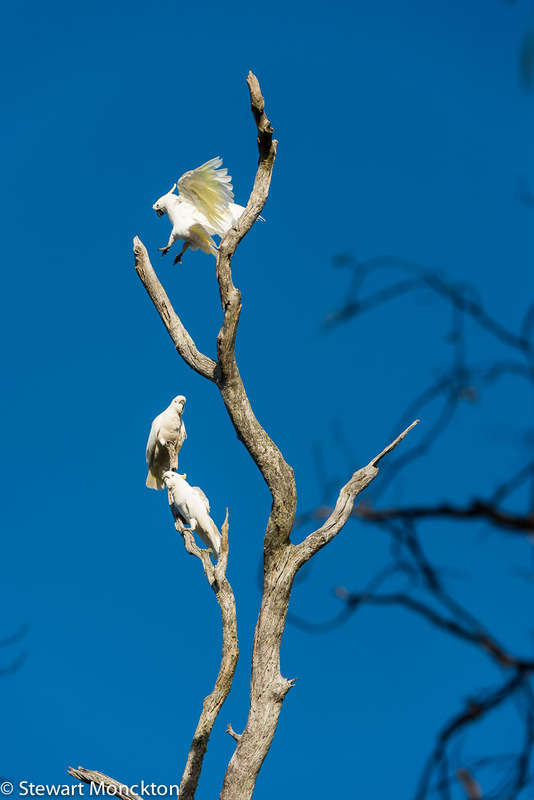 These birds - there were three - were in some rather low gum bushes and for once I was able to get some shots. My more normal experience of these birds is that they inhabit high, neck straining branches rather than photographically convenient locations! 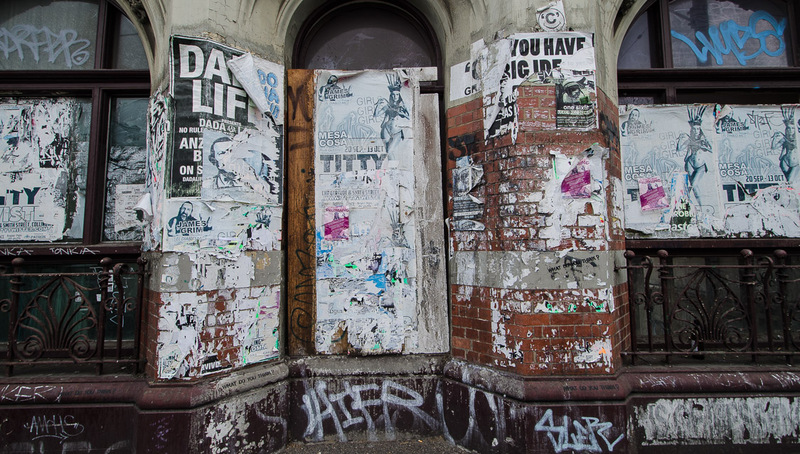 'Gang-gang' is thought to be Aboriginal in origin, but which language this comes from is (as they say) contested! 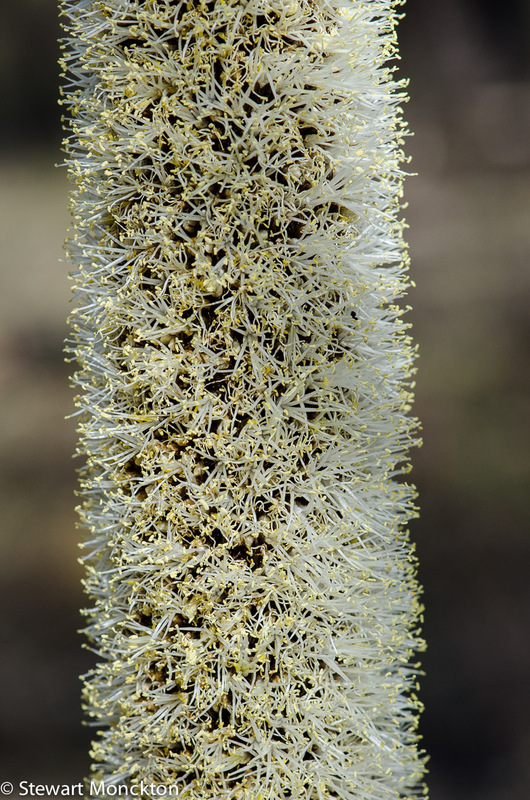 However, the scientific name is a model of clarity - Callocephalon fimbriatum - means beautiful fringed head. And as I said, there is no argument with that. The bird without the red/pink head is a female. 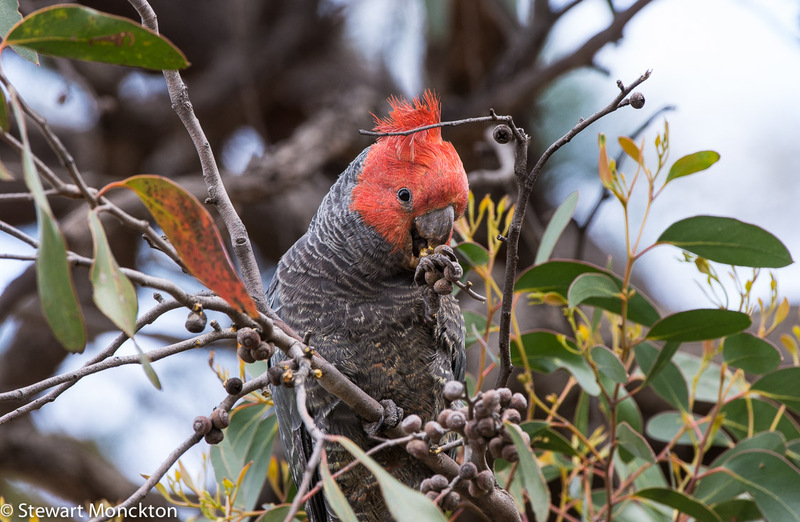 In many of these pictures you can see the bird using its claws to help it gain access to food in the gum nuts - the two forward, two backwards arrangement of the claws (similar to that of woodpeckers) seems to be an advantage here. The small right to left twig at head height is a wee bit annoying - but such is life I suppose! 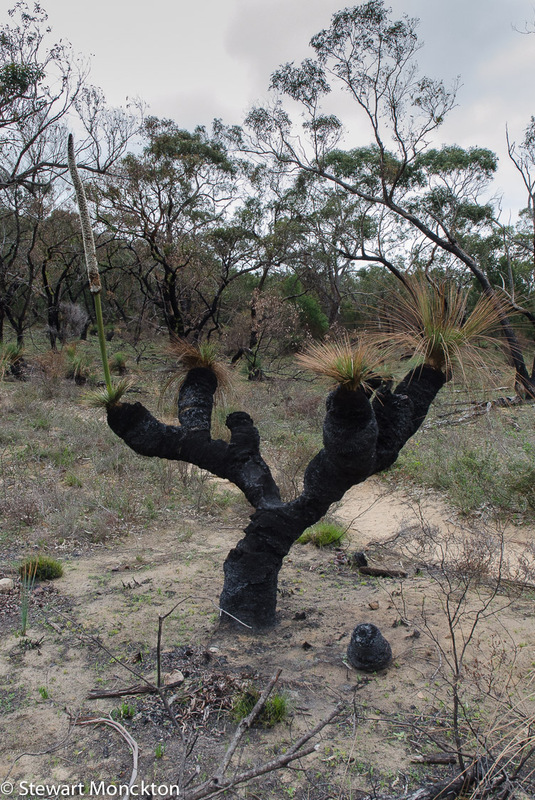 Grasstrees are a strange looking sort of plant that is endemic to Australia - their twisted and often blackened "stems" are characteristic perennial plants of many parts of the country. 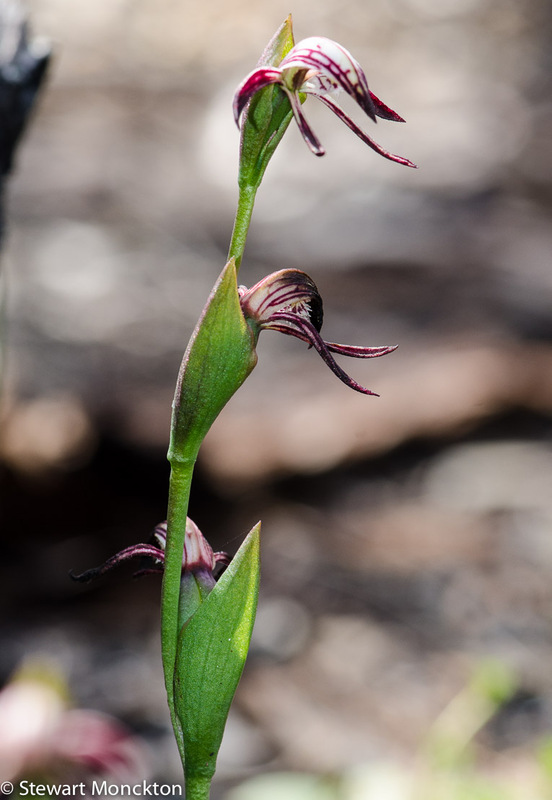 The blackened stem is not a true stem at all really, but a hollow structure formed the the base of the of the leaves. Roots run down through the hollow centre to connect to the ground. 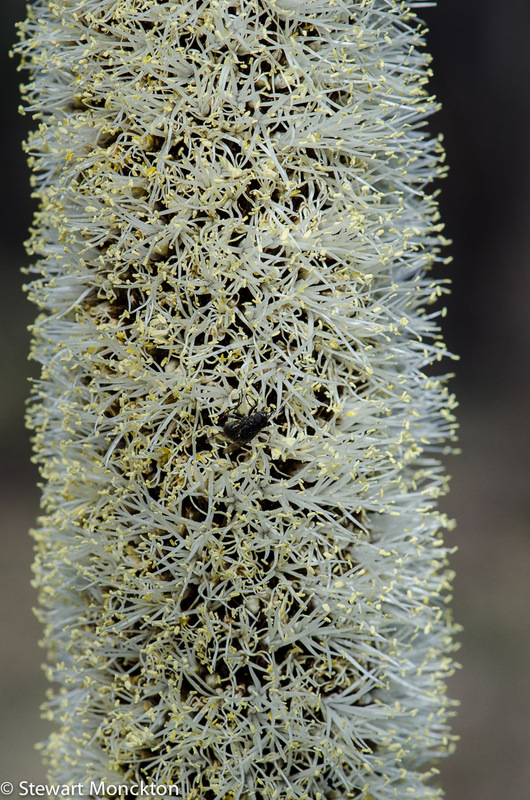 These plants often respond to fire by sending up large flower stalks, and after a fire they can become very visible in the bush. Far from destroying the plant, fire is vital to its long tern survival. This kind of relationship with fire is common in Australia. 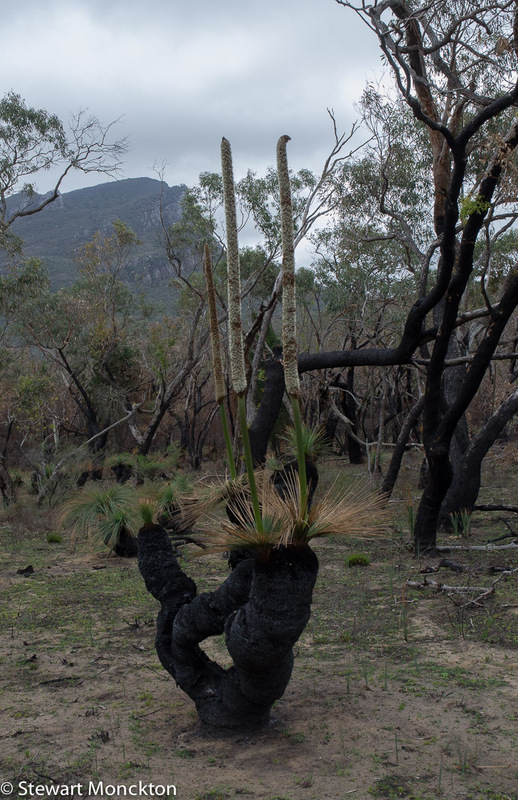 The larger plants in these pictures are likely to be well over a hundred years old - you may not be surprised to learn that these older plants are sometimes stolen from the bush and sold on the black market! Thankfully, there seems to be some regulation to prevent this. 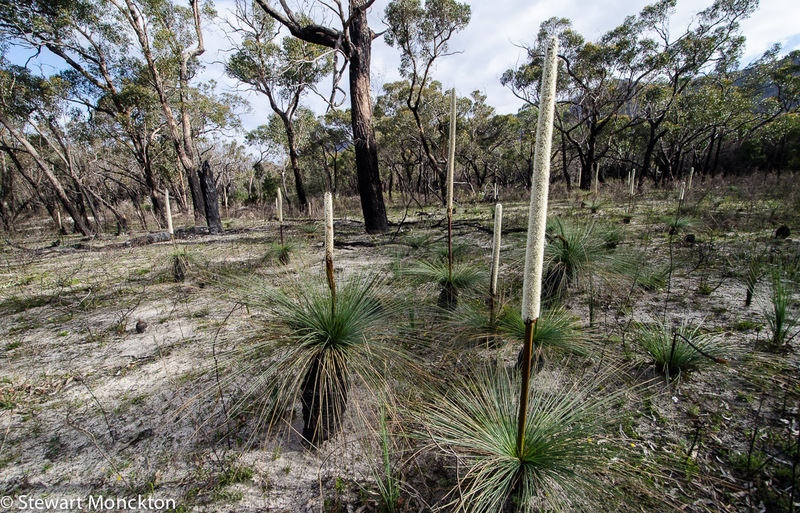 These plants were widely used by Aboriginal Australians, with the flower spike being used as a fusing spear. The flowers can also be soaked in water to produce a sweet drink. During the early stages of European colonisation, sailors often saw these lanes on cliff and headlands - the dark shapes with tall 'spears' were sometimes mistake for people! All of these pictures were taken in the Grampians - a National Park about a 3 1/2 hours from Melbourne. 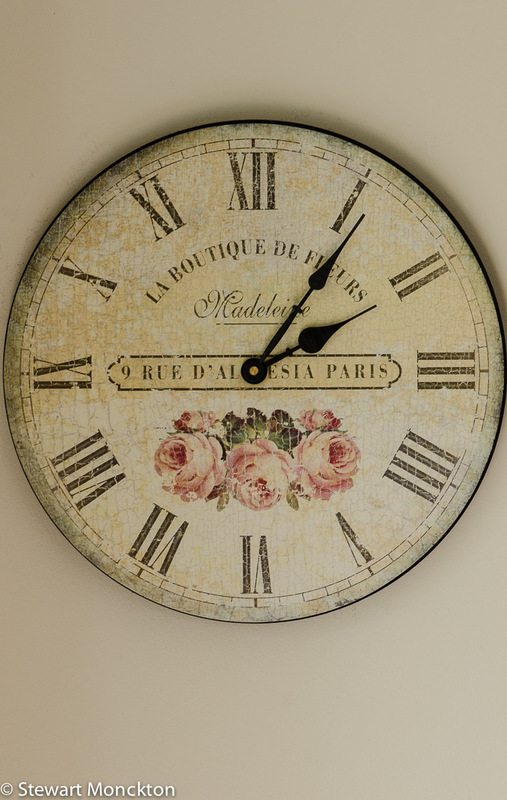 What can't we deal with IV? I wonder why the Roman 4 is incorrect? Nine is OK. Strange. 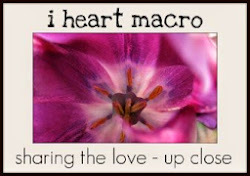 You can find more close up style shots at Macro Monday2 and I Heart Monday. I think I need a bigger room / When are you going to move out? Kangaroos are probably even more iconic of Australia than the koala I posted a while back. 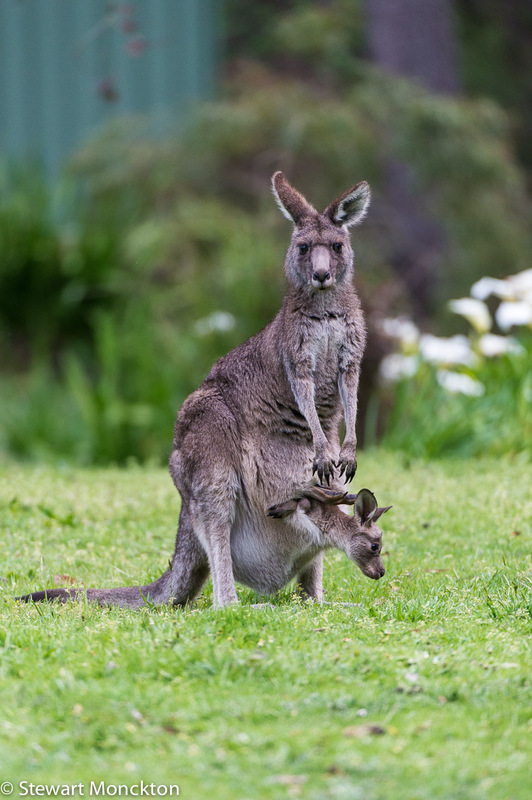 Despite the evidence circulating in certain social media sites, most of us don't have 'roos in the garden, or fighting each other in the street! 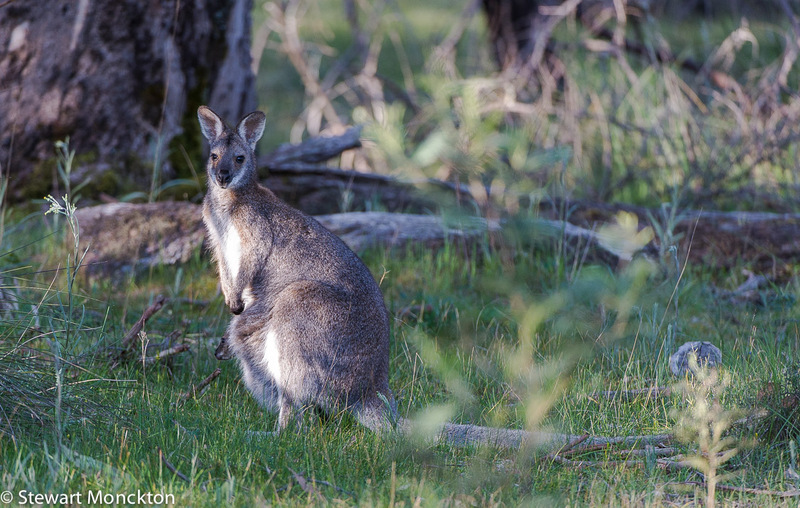 However, even through I live in a reasonably urban area, there are kangaroos within 15 minutes of my house - you just need to know where to find them! 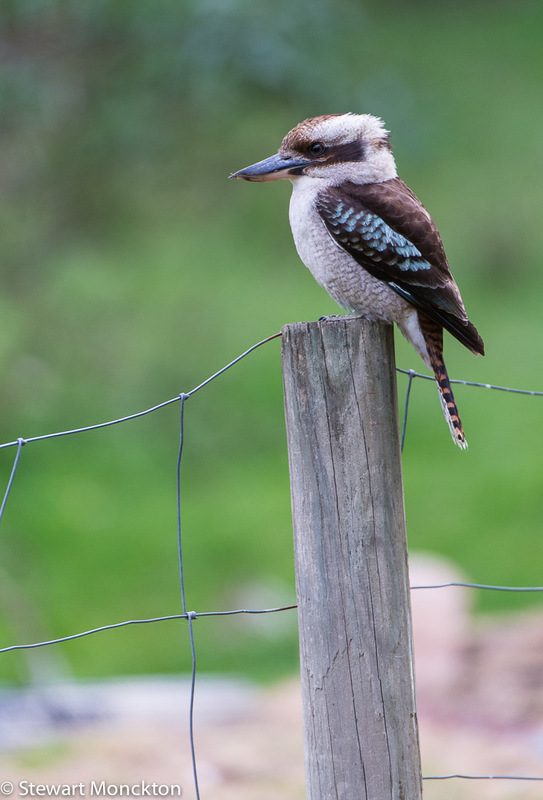 These pictures were taken much further from home than that - if the truth be told, these animals are very used to people - they live in and around a small town calls Halls Gaps, and can be found most evening browsing on the towns sports oval! 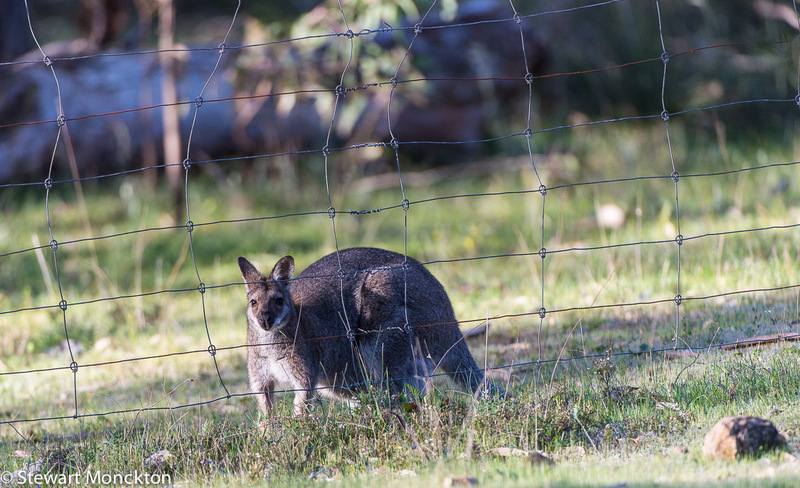 These animals were just over the back fence of the house we stayed in - very close to where I saw the emus. 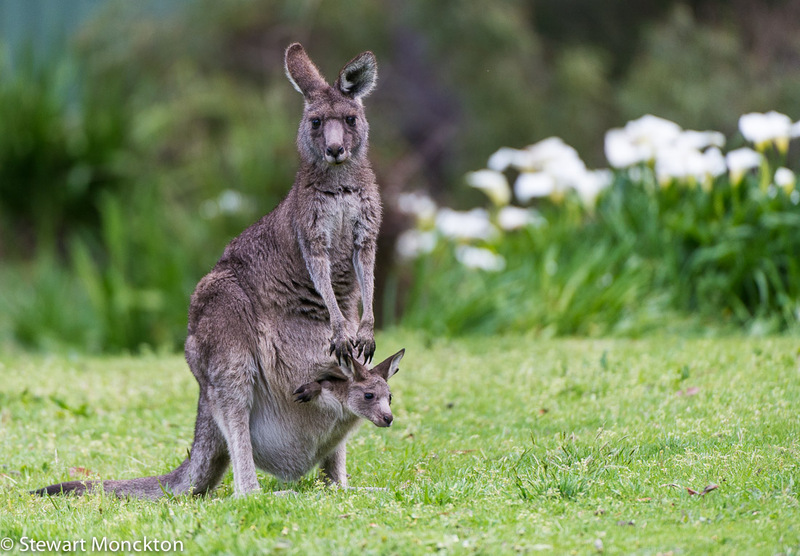 So, here is an Eastern Grey Kangaroo, complete with a well grown joey. 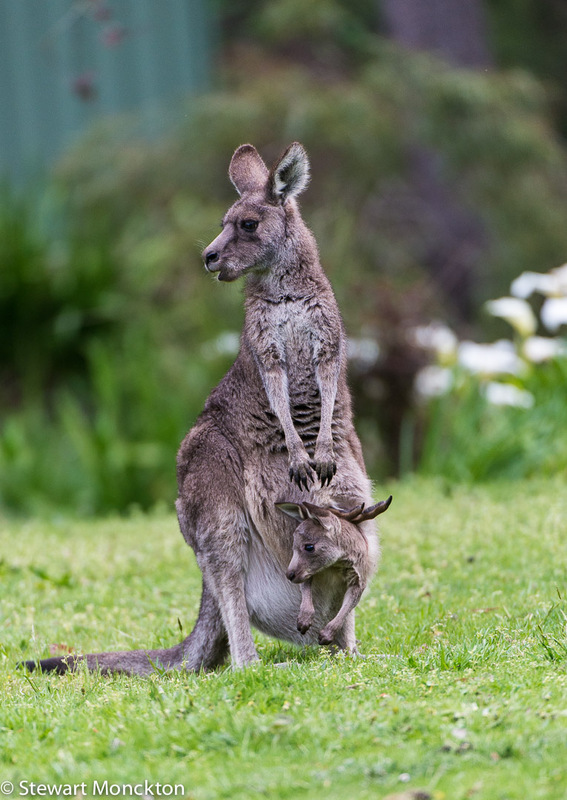 I am always surprised at the size of joeys that can still get into and back out of the their mother's pouch. You can find more creatures from around the world at Saturday Critters. 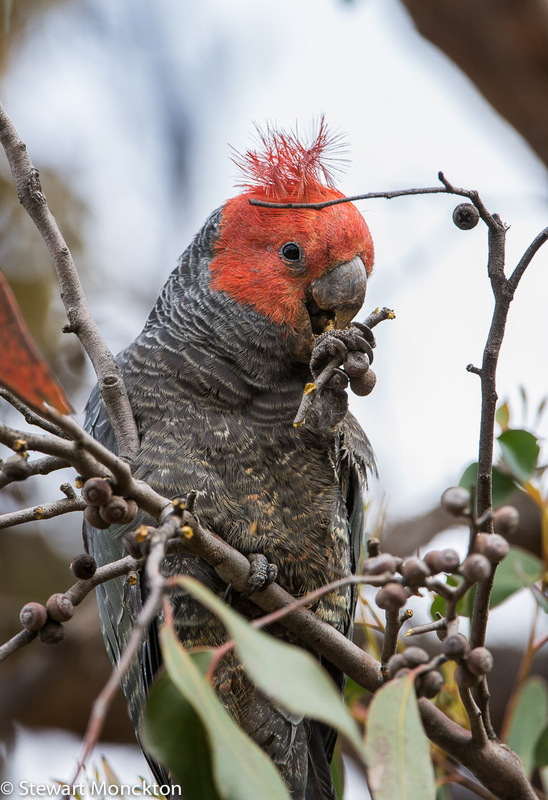 After a run of birds from the UK, I'm back to Australia birds this week. 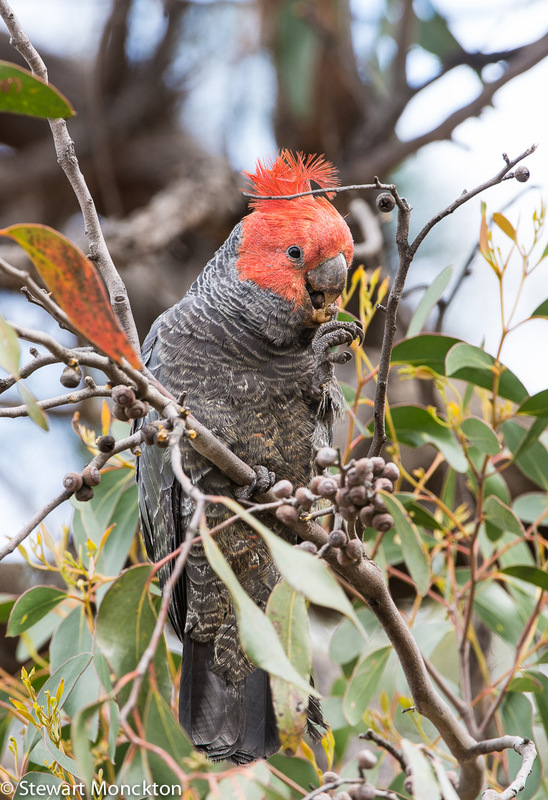 And this is a very Australian bird. 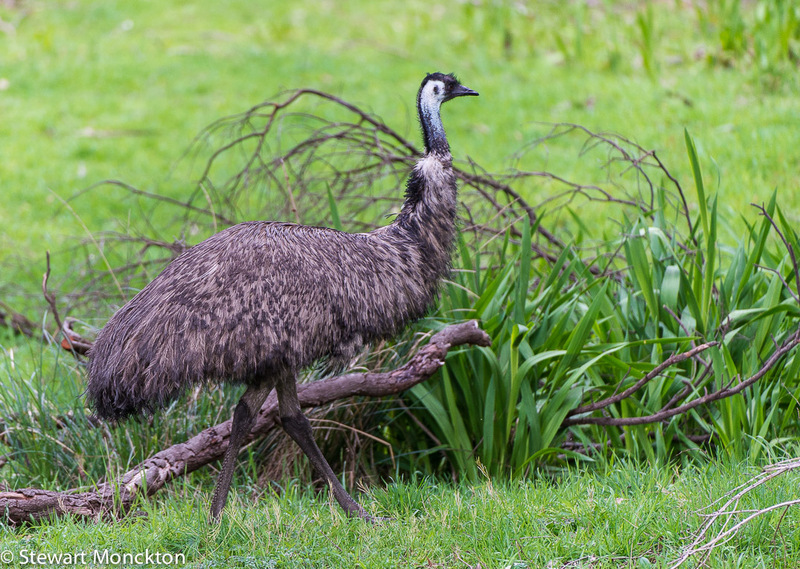 The emu is a large, maybe even huge, bird - 1.6 to 1.9 m tall and weighing in at 30 - 45 kg. 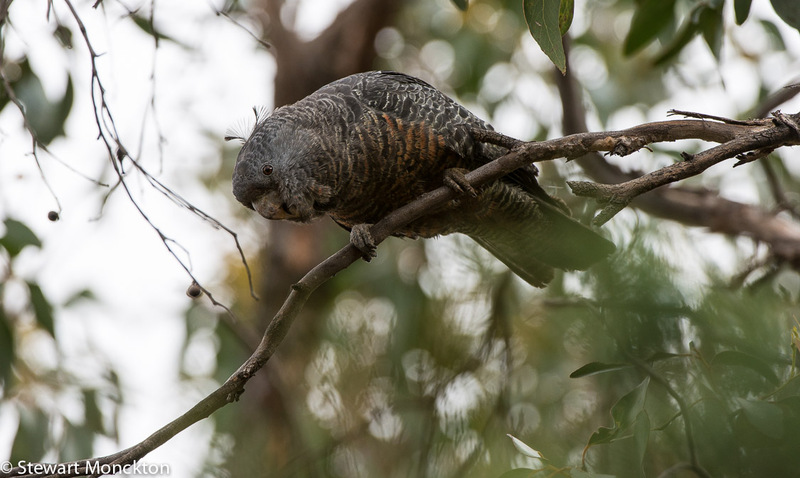 It is endemic to Australia - meaning it occurs nowhere else. 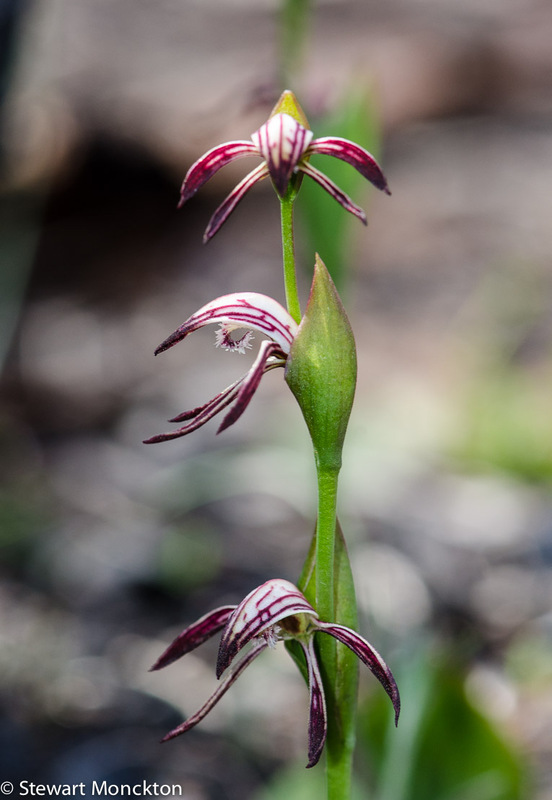 It can be found of most of the continent, but it's absent from Tasmania. There were once smaller species on King and Kangaroo Islands, but these species are now extinct. 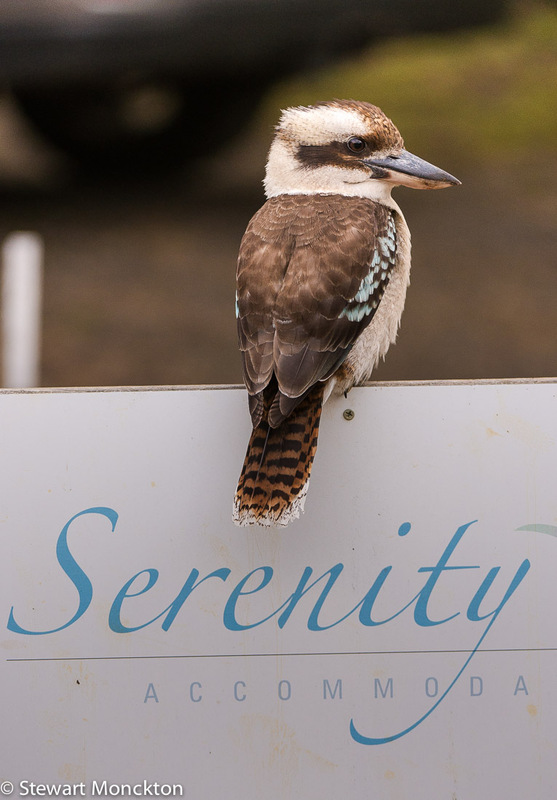 Both the common and scientific names have a tale to tell about the European settlement of Australia. 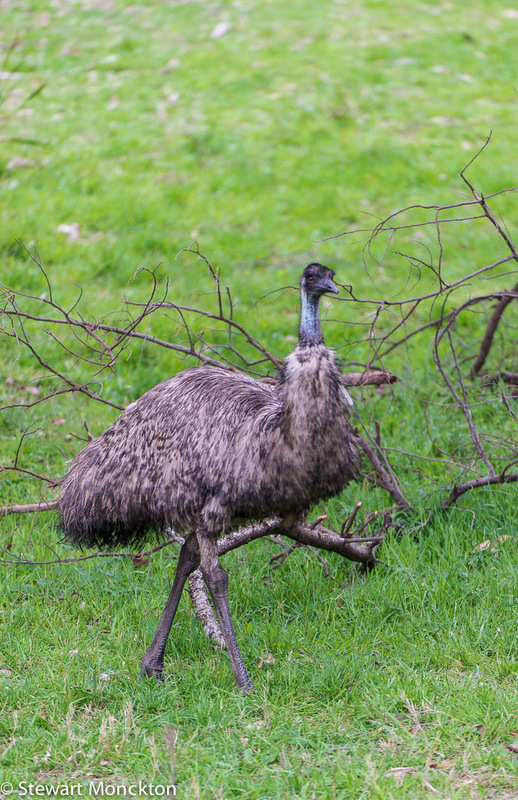 The name Emu is thought to be a corruption of the Portuguese word 'ema' which was used to describe all the large flightless birds that sailors encountered. 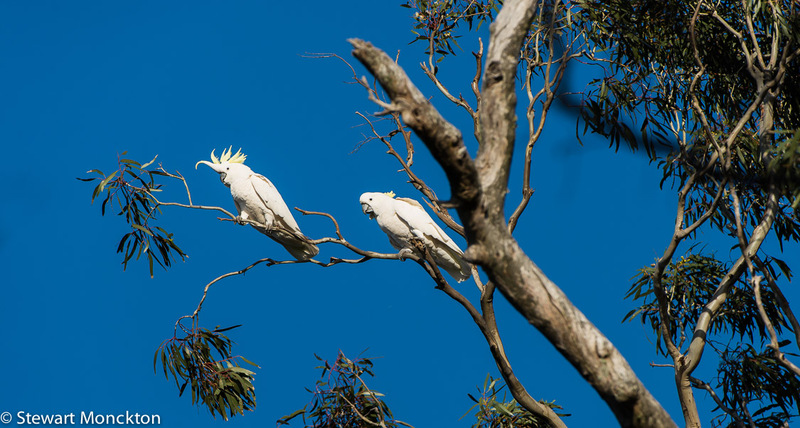 Equally investing is the idea that although the name is Portuguese in origin, it was bestowed on the Australian bird by Dutch sailors - Portuguese was a kind of "common tongue" between sailors in the East Indies in the late 1700's. The scientific name reflects both the biology of the bird and the history of Australia - Dromaius novaehollandiae - means New Holland racer. 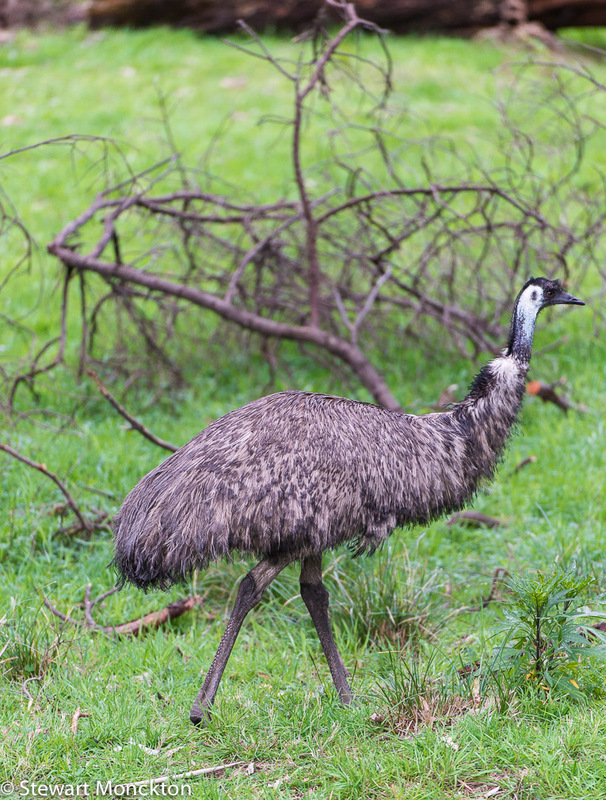 New Holland is an old name for Australia and the bird can run at around 50 kph (30+ mph) if needs be. So this all makes sense. These birds were doing nowhere near their top speed as they wandered past the boundary of the house we were staying in last week; this rather reduced the drama, but made for easier focusing!